1. 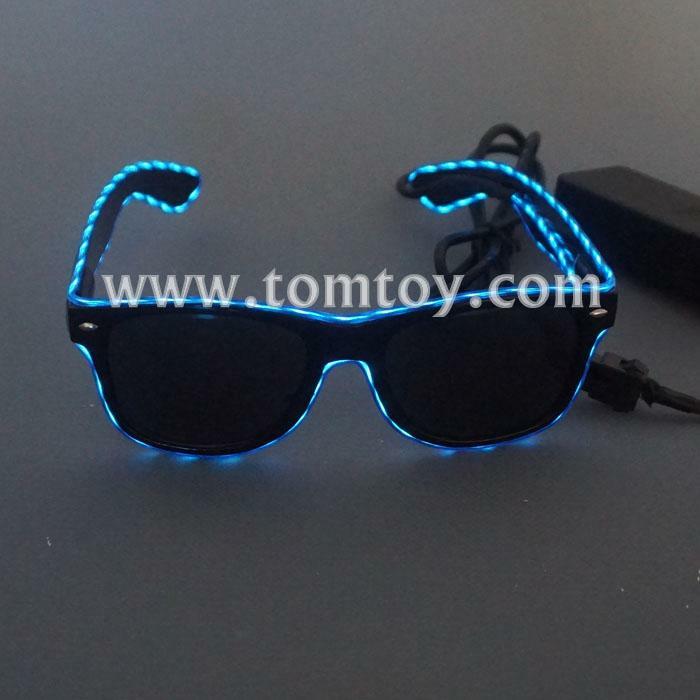 EL glasses come with a black frame and black lens and bright EL wire, perfect for night time. 2. Our 3-mode battery pack uses 2*AA batteries, giving you 8-24 hours of light per set of batteries! 3. The lens has white, black and black transparent for your choice, it is UV400 protection. 4. The battery pack can be put inside your pocket or clipped to your pants/shorts. 5. 3 light functions: Forward flash, Backward flash and Steady Light. The Flow Speed can be controled by the rotary switch on the battery case. 6. EL Wire color: Red, Yellow, Orange, Transparent Blue, Blue, Pink, Purple, Fluorescent Green, Jade,and White.Any two of EL wire color can be combined.